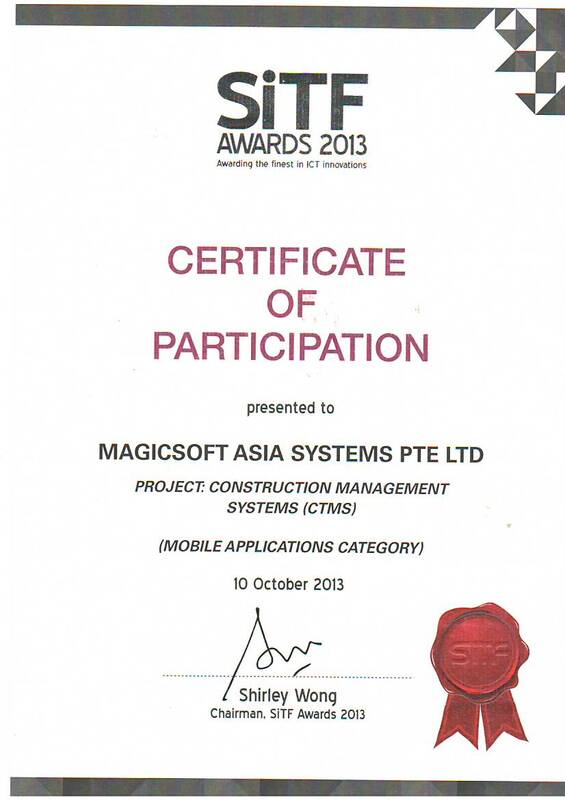 Construction Management Systems (CTMS), is one of the software listed under iSPRINT (Packaged Solutions). SMEs can claim up to 70% of the qualifying costs, capped at $20,000 for the purchase of the first packaged solution (listed) under each solution category. (This is subjected to fulfilling the SME eligibility criteria and the availability of funds). The balance of 30% can be claimed under IRAS PIC here. Click here to read more on IRAS PIC. For more information on iSPRINT packaged solutions, visit IDA website today. Construction Management System (CTMS) is also eligible for the Mechanisation Credit. Construction firms can claim up to 50%, or 70% for companies who achieve higher than 30% productivity improvement, capped $250,000 per firm. SiTF Awards was inaugurated in 2009 by Singapore infocomm Technology Federation (SiTF). This Award, championed by the industry, is an important accolade for made-in Singapore infocomm innovations. Over the years, besides recognising innovative ICM (Infocomm Media) Applications/ Solutions which are developed locally, SiTF Awards has evolved and extended its reach to include recognition to companies which have taken efforts to innovate its business through the adoption of technology.